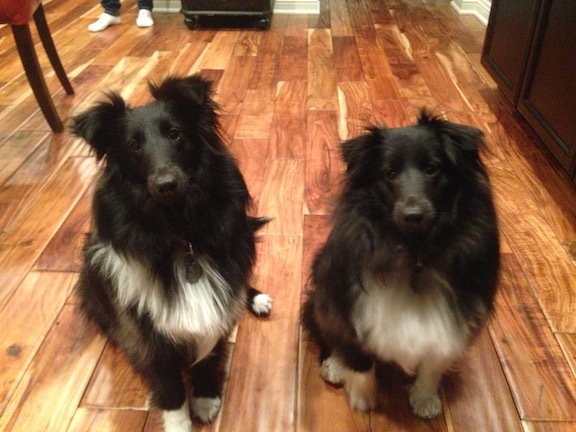 Maya (left) and Gus are one and a half year old bi-black Sheltie litter mates. Their owner contacted me to stop them from getting so excited when guests arrive, not listening, barking and running the fence line in the back yard. When I arrived for the session I projected a calm but assertive energy towards the dogs. They barked a bit but weren’t what I would call overly excited. Their owner mentioned it was a more subdued greeting than they normally gave which was likely due to my behavior and energy. I didn’t try to make friends with them. I wanted to think that I was paying them no mind as I entered and sat down with their owners to discuss the session. Maya attempted to jump up on me and so I used a sound and movement to communicate I wanted her to respect my personal space. After correcting her, Maya moved away and sat next to one of her owners. While this was going on, Gus came over to give me a deep sniff. He was interested but showed a nice respectful energy and distance so I let him “meet” me through his nose. When Maya noticed this she came over and jump dup again in what I believe was an attempt to claim me. I repeated the same sound and movement and got a similar response from Maya. But this time she stayed farther away from me. A few minutes later their owners commented that the dogs were acting like each other. Normally Gus was slower to approach strangers, lingering on the corners of the room or under something while Maya was the more outgoing dog. But now it was Maya who was staying on the perimeter and Gus who was being social. As we discussed what their owners wanted out of the session, I noticed that Maya could often come over to whoever was petting Gus and in a few instances, presented herself in a way that blocked the humans from petting Gus. This can be a herding trait, but combined with her earlier behavior and a few comments from her owner about previous behavior, I am of the opinion that Maya was in fact trying to dominate and control her smaller litter mate. I suggested that their owners start blocking her when she attempted to interrupt them from petting Gus or providing him attention. It will also be important that they disagree with her when she attempts to block him out or overly dominant behaviors. The dog’s owners repeatedly commented on how it was nice to see Gus come out of his shell. They also expressed some concern about Maya and the change in her behavior; not wanting her to feel bad. I reassured them that this behavior was due to Maya not knowing how to react when someone else took over the leadership position in the home. This reinforced my belief that Maya was a little insecure and was using dominating and controlling behaviors to head off any challenges from her litter mate before he could even consider doing so. Next I went over a few communication methods to reinforce behaviors and actions they wanted as well as how to disagree with those that they did not such as Maya’s over licking of her owners. As soon as her owners adopted these new communication methods, both dogs were immediately responsive. Because the dogs over barked at the door and the back yard, I showed their owners how to claim the space around the front door. One of their owners played the part of a guest so I could show them how to claim the door and communicate that the dogs were to stay ten feet away. When we switched things up and I played the part of the guest, the dogs were far less responsive and barked only a few times. Their owners will need to practice this exercise a few more times for the dogs to stop getting over excited and rushing the door when someone rings the bell or knocks. Many of these dog’s issue were a result of the dogs being too excited. When their owner went to get the leashes, she started asking them if they wanted to go for a walk in an excited voice. This caused the dogs excitement and energy to rise as well. I had their owner repeat the exercise, but this time not say anything about going for a walk. They were much calmer and once the leashes were on, were calmer still. Another activity that got the dogs over excited was being let out of their pen in the basement. Using the principles we used with the leashes, I had their owner open the gate without saying anything to the dogs, but only open it wide enough for her to stand in. The dogs were excited at first as they usually would race out of the pen as soon as the gate was opened. But by stopping and waiting for the dogs to return to a calm balanced state before letting them out, we can help the dogs understand only a calm demeanor will be rewarded. By the end of the session, both dogs were completely calm and were responding immediately to their owners commands and corrections. While Maya was a little more reserved than normal, she was engaging with us again, but without all the energy and attempts to control Gus. I was particularly happy with the results of this session. Not just in terms of how quickly both the dogs and humans took to the new techniques and exercises, but because I was able to help Gus come out of his shell. We didn’t have to result to any alpha rolls or other dominance theory methods, just clear communication of the expected rules, boundaries and behaviors. Now that their owners know how to communicate what they want and how to disagree in a way the dogs understand, the exercises and techniques I showed them should put an end to any lingering issues that remain.